You know how sometimes you’re watching a video or a movie and at the bottom of the screen you see a text of what’s being said? Well, people type those in, for pay, and you can do it, too — from home. As a Captioner you’ll get to watch a wide variety of content — TV shows, movies, educational vids and more. You’ll add the captions using Rev’s proprietary captioning software. No experience required – Rev provides the training. All you need is a computer, headset, broadband internet, and strong English skills. We just received this tip / advice about applying with Rev.com from Kim S. who recently started working for Rev.com. Just wanted to take a sec to thank you so much for your Daily Leads… I currently have 3 WAH jobs thanks to your awesome research, the most recent of which is a captioning job with Rev!! Here’s an inside tip for you and your readers: According to the onboarding email I received from Rev yesterday, only 10% of their applicant get hired after the testing phase, so let your readers know to pay extra attention while testing!! The testing itself is not AT ALL difficult; it’s just very detail-oriented… if they focus and give the testing their undivided attention, your readers should NOT have a problem becoming part of that 10%!! Thanks again for all you do – as a single mom of a 3-year-old son, your help has been invaluable, and we both thank you from the bottom of our hearts!! 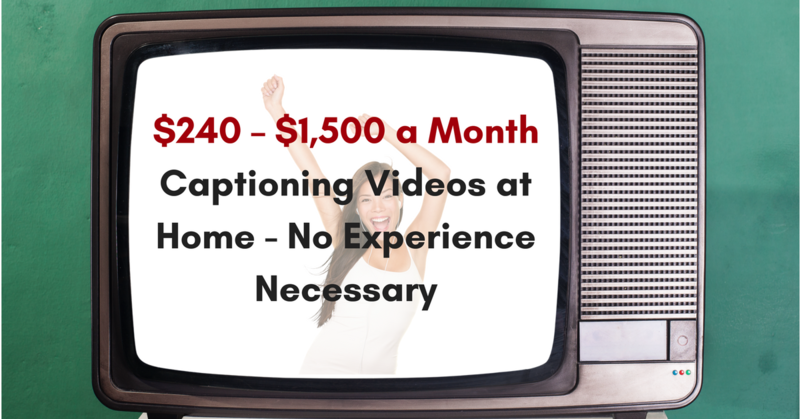 Earn $0.40-$0.75 per video minute. Average monthly earnings: $240, top monthly earning: $1570. Paid weekly via Paypal. Work as much or as little as you want, when you want. Choose your projects: Rev has a wide variety of content to be captioned, from popular TV shows and movies to Khan Academy videos. To go straight to the job, click here. For more jobs like this, check our Newest Jobs & Gigs page. To be the first to hear about jobs like these, like our Facebook page. Good luck as you make your work from home plans a reality! This entry was posted in Earn Extra Cash, No Experience Necessary, Non-Phone Jobs, Work at Home Jobs and tagged Rev. Bookmark the permalink.